Your comments are quite interesting. I have been taking black cherry pills for a few week. With regards to pink cherry pills, how many shall I take daily? Hello, Roland. You should ask a doctor if they are good for you and how many you should take depending on what you are taking them for. I imagine these supplements are taken for their antioxidant benefits, to recover faster from colds or other respiratory infections or to boost immunity. But you can find all of these benefits in cherries themselves. You can eat them fresh off the tree or juice them at home. It’s safer and just as healthy. From my knowledge, these supplements may contain cherries, cherry juice, bark extract etc. But some of the elements they contain may be unsafe in certain amounts or interact with regular medication and produce side effects. 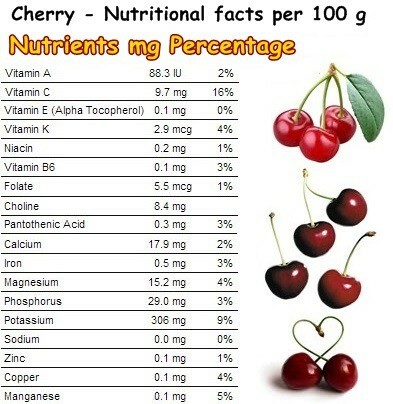 So if you want to enjoy all the wonderful health benefits of cherries, maybe it’s best to just eat the fruit. And make sure you are not allergic to cherries before eating them. Wishing you lots of health.